Life Before the Dinosaurs: Edestus. 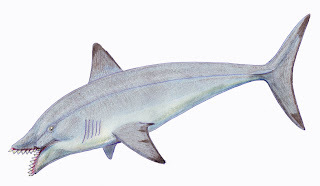 Edestus is a mysterious genus of edestid shark. Some of the other edestids are Sarcoprion, Ornithoprion, Parahelicoprion, Helicoprion, and Campyloprion. There are five species of edestus: E. giganteus, E. heinrichi, E. mirus, E. minor, and E. vorax. Edestus giganteus is the most mysterious species of edestus, because people have only found one fossilized row of teeth. This fossil of Edestus shows what the pinking-shear-like saw looked like. No one really knows where in the jaw the pinking shears went---if one went out of the lower jaw, if one went out of the upper jaw, or if there was one on the lower jaw and one on the upper jaw. Edestus may have used its saw to cut prey in half. The jaw isn't the only mysterious part of Edestus, because no one knows what Edestus's body looked like---if it was long, tapering and eel-like, like the body of a Xenacanth shark, or if it was more shark-like, like the body of a modern day shark. Art Dr.Zangerl would of enjoyed reading this and meeting you.He died Dec.2004 but before he did,he submitted a paper on Edestus tooth problems & I forgot the rest of it.Sorry!! !Field Museum is were he sent it in 02 or 03 for print. Thats the last I heard of it. I've seen all the material plus he id all of My black shale fishes by 2002 at his home.OH YOU MUST JOIN SPNHC. Life member is under 900 or its 35 ayear. For your age life would be best. Its a must for your plans to go pro .Keep up the work your doing you are on the right track. We need alot more people like you !!!!!!! !